The year is 2013 and a new power is on the rise. After the dismantling of Quantum, thanks to the efforts of MI6 and their most notable 007, several most powerful (and most shadowy) organizations have come together to form an alliance called Spectre. While the entirety of the organization is still a mystery, intelligence agencies across the globe are well aware a new force has arisen. In response, the European Union agreed to bolster Europol's forces to create a continent-wide police force designed to combat international crime. Globally, many foreign governments outside the EU are hesitant to enact such drastic measures, preferring to rely on their own national security. Welcome to For Queen and Country. 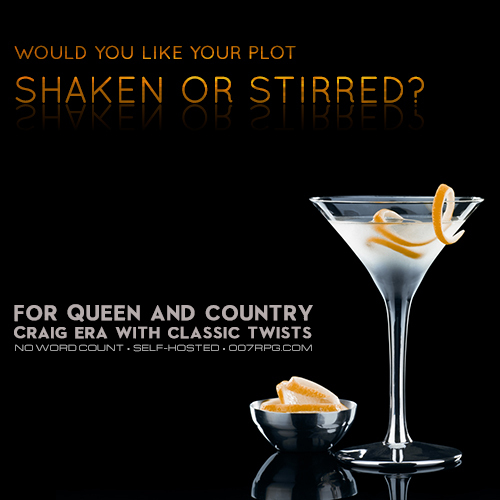 We are a no-word count, nearly free-form app, canon Bond board pulling inspiration from the entire 007 franchise. Knowledge about James Bond is not required. Fun, however, is always a requirement.